Let me just say up front, I really hated writing that last post. There’s so much more than I can cram into a blog post, it’s unbelievable. There are competing doctrines of creation, details given in the Bible that complement the details given in Trismegistus, and Timaeus, the thing that started it all… Man. There’s a lot that was left out. But that’s yesterday. On to the Harmony of the Spheres! 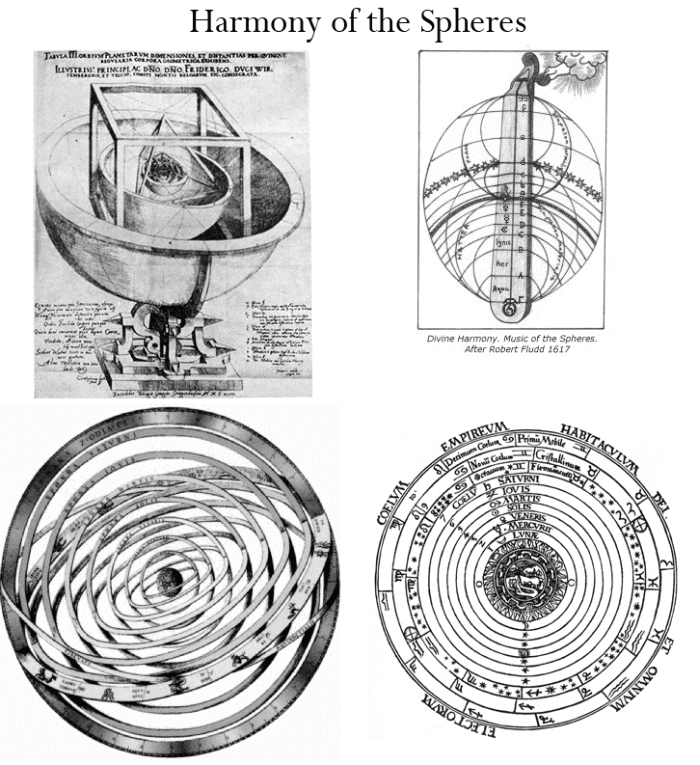 Ok, so there are spheres within spheres that make up the cosmos beneath the realm of God. There’s a sphere that has the constellations on it, a sphere for each of the planets, a sphere for each of the elements. That’s 12 spheres (hey, just like the number of astrological signs, and the number of tribes of Israel, and the number of apostles, and the hours in a day and in a night, what a freaking coincidence!). Now, there aren’t “really” 12 spheres. The realm of sensate matter is the lower four spheres, the Elemental spheres. This sphere includes all the physical planets, stars, galaxies, universes, etc. that we can and cannot see. Anything that can be sensed exists in the realm of the the elements, below the sphere of the Moon. So the elemental spheres, while separate and harmonious, blend together in to what we see. This is the sphere that can be sensed through our material bodies. The uppermost sphere, that of the constellations, can be viewed as an influencing sphere as opposed to a governing sphere. Agrippa talks a bit about this, and I won’t get too into details here, but suffice it to say that in my understanding of the NP cosmology, the sphere of the constellations is more like a barrier between the realms of the planetary governors (ending at the horizon of Saturn’s Sphere) and the unknowable Realm of God (Light-Divine Darkness-the One). The constellations can be viewed as pinpricks in this barrier through which the infinite light enters the realms of sensation, guiding or feeding as it were, the planetary governors. Now, what we’ve done here is divided the infinite universe into three parts. The material realm is composed of the four elemental spheres. The seven spheres of the planetary governors is the second part, ending at the barrier of the Sphere of the constellations. Then there’s the infinite realm of God, the third part. Only the realms of the Planetary Governors and the sphere of matter can be known and interacted with consciously. The higher realms may be experienced, but being before the utterance of the Word, they can’t really be put into words. This bubble of perception is our sphere within the material realm. The Emerald Tablet of Hermes, an excellent model of magickal operation on its own, bears the famous inscription “that which is above is like that which is below.” Metaphysically speaking, we have a spiritual sphere of sensation as well as the physical sphere of sensation. They aren’t really separated, but it’s easier to think of them as parts than to try to understand the whole all at once. A seed in an orange doesn’t look like an orange, and neither does the peel by itself, but they’re still one thing. The basic intent of the magician is to get their “sphere” into harmony with the other spheres. Neo-platonic philosophers had various ways of achieving this. Plotinus taught that you could instantly “get it” by realizing your race and value. He talks about denigrating the things of matter and exalting the things of spirit. He, and Porphyry, his student and biographer, believed that the way to reclaim your race and value was through Philosophy, and various forms of Asceticism. Later, some Gnostics and others would take the idea to the extreme. They believed that because matter distracted you from your goal of reuniting with God, then all matter must be inherently evil. Some went so far as to claim that the God that created Matter must have been evil. Plotinus had another student that helped us out immensely as magicians who would rather do something more active than philosophize all day, and who wanted to participate in the matter-manifestation process in a more hands-on way. This guy was Iamblichus. He taught that theurgy, magickal arts and working with spirits were viable means of reuniting with the One, God. That’s the core of this system I’m presenting here. There are various other branches of neo-Platonism, and lots to discuss and argue about, but as magicians working with the NP magickal system, the point is to harmonize our sphere with the spheres above, and through this harmony to join with God, accomplishing what later became known as the Great Work.